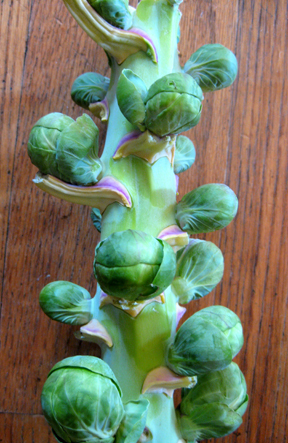 I recently picked up a gorgeous stem of Brussels sprouts at M&M Green Valley Produce in South Deerfield, Massachusetts. These little cabbage relatives perk up the farm stand at this time of year, particularly when still on their stems: varying shades of warm green blend with just a hint of pink here and there. I’m not sure you could call what I do with them (and what most of the world does by now, I should think) a recipe. I’m writing it down anyway. It’s easy, and it’s addictive. 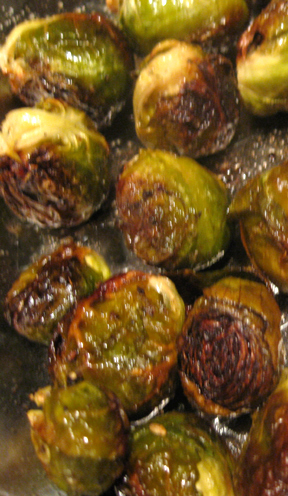 When I was a little girl my family tended to boil Brussels sprouts. This is NOT a cooking method I recommend. The process fills the house with an unappetizing cabbage smell. By the time you get around to eating the darn things they don’t appeal to you at all. To cap it off, they end up pretty soggy. In contrast, oven-roasted sprouts are crunchy and delicately flavored. The salt and pepper stick to them (because you’ve tossed them with oil) and pop out at you as you eat. Yum! This is as close as a vegetable gets to tasting like dessert. Preheat the oven to 400 degrees. Wash and drain your sprouts. Cut off any messy (especially yellow) leaves, and trim the bottoms. With a sharp knife make a little cross in the bottoms to help the sprouts cook evenly. In a small pan (I use a pie plate) toss the sprouts with the oil, salt, and pepper, making sure they are nicely coated. Roast them, turning from time to time, until they are nicely brown and crispy. This will take between 30 and 45 minutes, depending on the size and age of your sprouts. Squeeze a little lemon juice on top if you want to, and serve immediately. Serves 4. This entry was posted on Tuesday, November 10th, 2009 at 4:00 am	and is filed under Vegetables. You can follow any responses to this entry through the RSS 2.0 feed. You can leave a response, or trackback from your own site. I absolutely love the photos you’ve included in this post – the “straight from the garden” image of brussel sprouts still on the stalk and then right out of the oven (and cooked to perfection in my book). I could have written this post – it tells the tale of my experience with these delectable treats. I’ll stray from roasting them once in a while to try a new way of preparing them (NEVER boiling them), but this remains my “go to” recipe. Have you ever tried Borsari seasoning? That’s what we use and I’m hooked. I use it on EVERYTHING. I get it at Big Y if there’s one near you – at the meat counter. I use the original blend. Hi, Julie–I’ll be going to the Big Y later this week; I’ll keep my eyes open for it. Thanks! I have never tried cooking brussels sprouts this way. I may have had them at a restaurant cooked this way before, though. Unlike some people, I do like brussels sprouts sometimes. I think roasting them makes them look good. The picture makes me want to taste them! I have Twittered this one. I try to tweet about all of your postings, but only get to do it when I have a little time. Great post! Have a great holiday too. Same to you, Betsy Anne–and thanks for the tweets! Readers, Betsy Anne may be found at http://www.betsyanne.com. She is one of the busyest and nicest bloggers around…….. This is the only way I like Brussel Sprouts. You are absolutely right – boiling them turns them into an ugly cousin. I enjoyed your post about Johnny Mercer. I live a little over five minutes away from his final resting place (in the beautifully eerie Bonaventure Cemetery). There’s a marble bench to sit on at his gravesite engraved with “…and the angels sing.” People go there to open a glass of champagne on his birthday and toast his genius. I like mine pan roasted with bacon and thyme, thank you. Super tasty, and even my husband the Brussels sprout hater will eat them… Daughter Paige is another story. We give her peas instead. Great additions, Erin! Readers, I emailed Erin for more information. Use about 1/4 cup of chopped bacon. Fry the bacon pieces until slightly crisp; then add the olive oil, sprouts, salt, and pepper, along with 2 to 3 teaspoons fresh thyme. Toss well and transfer the contents of the frying pan to the pie pan, and roast as above. Erin says she cooks them at 350 degrees so you may have to increase your oven time a bit. Yum…… I can’t wait to try them! As for Grad, I wish I could toast it with you. I love the song “And the Angels Sing”……. Tinky is a sweetie. And a super-hard-working Cooking Blogger. She has always been a true original. Tinky, my Thanksgiving vegetable assignment will now be delicious thanks to you and our grandmothers kitchens website.